Photo by Thomas Ames, Jr. I'm delighted to welcome Miranda Neville back to The Romance Dish today. Miranda grew up in England where she developed a fondness for the books of Georgette Heyer, Jean Plaidy, and other historical authors. She studied history at the University of Oxford and spent years writing catalogs for Sotheby's in London and New York. Her debut book, Never Resist Temptation was published in 2009. Several more historical romances have been published since then, many of which sit on the keeper shelf in my library. 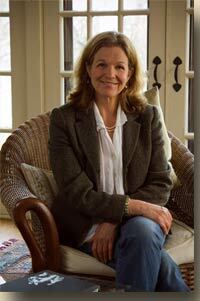 She now lives in rural Vermont where she enjoys cooking, gardening, and cross-country skiing. PJ: Welcome, Miranda! 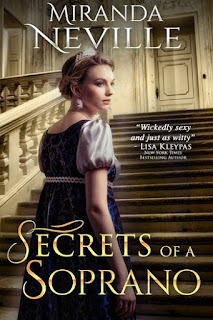 Congratulations on the release of your newest historical romance, Secrets of a Soprano. What can readers expect from this story? Hi Pj and Janga. Thanks for inviting me to the Dish and asking such juicy questions. 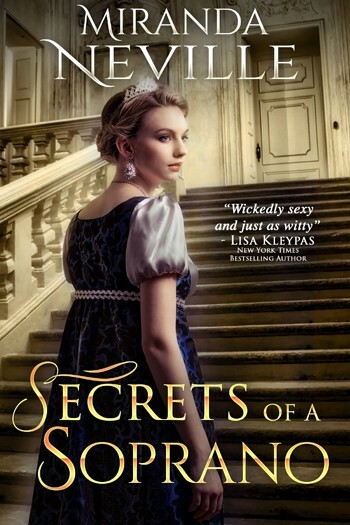 The heroine and hero of Secrets of a Soprano are Europe’s greatest opera singer and the owner of Regency London's newest opera house. In addition to their clash of interests, Tessa Foscari and Max, Lord Allerton, share a past, a teenage romance that fell apart due to the manipulations of their relatives. Each blames the other for a broken heart. Readers can expect a second chance at love romance set in the highly dramatic setting of the London theater, at a time when opera singers were celebrities who fascinated the public. PJ: I was fascinated too, Miranda. I loved the "behind the curtain" look at opera in the Regency era. In most historical romances, opera singers are portrayed as slightly unsavory, secondary characters. What inspired you to create a story with an opera singer as your heroine? historicals, there’s a limited choice of occupations beyond governess and companion. The great singers were actually the world’s most successful women for a century or so, achieving fame and riches on a par with modern day singers and movie stars. (An aside: a couple of days ago I read an article about women’s portraits on currency and learned that no fewer than five opera singers appear on their countries’ paper money, making it one of the top occupations.) I enjoy workplace settings, which add depth of background as well as being a splendid source of romantic conflict. It is true that among the aristocracy, where most Regency-era romances are set, performers were not entirely respectable—mistress rather than wife material. Yet some actresses and singers did make good marriages. The trick for the writer is to make the outcome plausible. PJ: In researching Secrets of a Soprano, what fact about opera in the 1800’s did you discover that most surprised you? I was fascinated by what I learned about the business of running an opera house or theater. The subscribers—like season ticket holders of today’s sports teams—were vital to the economics of the house. The users of the fancy private boxes provided money up front to fund expenses. However, box holders didn’t have the right to sell their tickets on nights they weren’t using them. They were supposed to tell the theater management if they weren’t using their boxes, then the theater could resell the tickets for extra income. However, box holders weren’t good about letting management know. So theaters employed “messengers” whose job was to find out what the subscribers were doing that night. I imagine them as a team of spies, grilling the servants of Mayfair and discovering all sorts of interesting tidbits about the aristocracy. Great plot fodder for a future book! PJ: I'd read that book! Janga: I’m a reader who loves books rich in context, and one of the things I love most about your novels is that you make your reader aware of the world beyond ballrooms and house parties. Can you tell us anything about the contexts of your next novel? I guess you can tell I enjoy delving into my settings! My next series, coming in 2017, concerns well-bred young women who lose their reputation and have to make something of their lives. Both the hero and the heroine of the first are writers. The hero is a somewhat Byronic poet, though a much nicer guy—I’m a fan of Byron’s work but not so much his character. However, the book isn’t as much about writing as it is about the literary and publishing world of Regency London. The couple in the second book is involved in science and inventing. As for the third, what can I say? The hero is a duke. People say dukes are overdone but I’m fascinated by the different ways that, historically, dukedoms have wielded power. In Confessions from an Arranged Marriage the hero inherits an immensely important political dukedom to which he is thoroughly unsuited. The Duke of Castleton in The Importance of Being Wicked comes from a family that is all about money, not politics. The Duke of Denford in The Duke of Dark Desires inherits his title unexpectedly and has to figure out what to do with it. My upcoming duke is an older man, in his late thirties, and completely comfortable with his own position and power, so I’ll have to give him some serious problems! That was a question about dukes, right? PJ: What authors do you enjoy reading when you aren’t busy writing books of your own? Too many historical romance writers to name so I won’t even make the attempt. I also have a weakness for the old traditional Regencies—shorter reads that have a lot of charm. Lately I’ve been getting into mysteries, which I haven’t read much in years. I recently enjoyed Midnight Riot by Ben Aaronovitch, the first of a series set in modern London with a paranormal twist. I have the first of Deanna Raybourn’s Lady Julia Grey books fired up on my reader. I’ve been meaning to read them for ages—better late than never! Janga: What unasked question do you wish someone would ask about your book? What an interesting question! Thinking about it, I’m not sure there is one. Sometimes I read a comment on a character or scene in a review and think “That’s not what I meant!” But once a book is published, it’s in the hands of the reader who has the right to interpret it in any way she wants. I am always delighted to answer queries, but I also let the work stand for itself. Janga: Is there any chance that you will revisit the Montroses? I love that family! I am so glad, Janga. I love them too and those four hunky sons are always in the back of my mind. I even have story ideas for the two eldest, Will and Rufus, the botanist and the archeologist. I’d probably have to self-publish their stories because I’ve switched publishers since the Burgundy Club, which introduced the family and the two sisters. Also, no titles! Not sure how four untitled brothers would sell in today’s duke-obsessed market. PJ: I’m enjoying the bright colors and balmy temperatures of spring. What season is your favorite? What makes it so? As I write this we have two inches of snow on the ground in Vermont. Brrr. But it’ll all be gone tomorrow, leaves are ready to burst out, and I can’t wait! I love the infinite promise of spring. The only thing it lacks is Christmas. Readers can find out more about me and my books and sign up for my newsletter on my website. Or find me on Facebook or Twitter. Thank you for visiting with us, Miranda. Would you like to ask our readers a question today? It’s relatively unusual for the heroines of romances to be celebrities, especially in historicals. Can you think of a famous woman, alive or in the past, whose story and character would make a great romantic story? Be brave, be bold! No idea is too far-fetched. I shall be taking notes. Two commenters will win digital copies of Secrets of a Soprano. No one knows the perils of celebrity better than Teresa Foscari, Europe’s most famous opera singer. The public knows her as a glamorous and tempestuous diva, mistress to emperors, a reputation created by the newspapers and the ruthless man who exploited her. Now she has come to London to make a fresh start and find her long lost English family. Foscari’s peerless voice thrills all London—except Maximilian Hawthorne, Viscount Allerton, the wealthy patron of opera—and lover of singers. Notorious Teresa Foscari is none other than Tessa, the innocent girl who broke his youthful heart. When his glittering new opera house sits half empty, thanks to the soprano filling the seats of his competitor’s theater, Max vows to stop the woman he unwillingly still desires. Amidst backstage intrigue and the sumptuous soirées of fashionable London, the couple’s rivalry explodes in bitter accusations and smashed china. With her reputation in ruins, Tessa must fight for her career —and resist her burning attraction to the man who wishes to destroy her. "My next series, coming in 2017, concerns well-bred young women who lose their reputation and have to make something of their lives.The couple in the second book is involved in science and inventing"
Kiri Te Kanawa is one of my favorite opera singers and du Pre was a childhood heroine - I played the cello briefly and badly. She certainly had an interesting and tragic life. I think Daniel Barenboim dumped her! Musicians often have explosive romantic relationships with each other. I decided my soprano needed a man who appreciated her without the clash of artistic personalities. I can't speak any more about the "science and inventing" because I haven't finished the research and my current idea may not pan out. I may have to make a switch. I'm looking forward to reading Miranda's book. Have to say I'm intrigued by the whole opera premise since I'm not too familiar with opera as a whole. I think Princess Kate being a commoner then marrying William, her Prince Charming (figuratively and literally) would make a great romantic story. Since they have dated during their university days then broke up for a while before reconnecting there's so much history between them to make a fantastic second chance at love story and a fairy tale come true! @Ada: There is a romance based on Kate and William. It's called The Royal We and written by the Fug Girls bloggers. I quite enjoyed it! I loved Secrets of a Soprano, Miranda. It is a book I know I will reread. Gertrude Atherton's The Immortal Marriage was one of my favorite books during my undergrad days. I've always thought Aspasia would be a great romance heroine, although a story set in classical Greece might not be marketable today. Mary Godwin Shelley might be a better model for a heroine. She belongs to the right period for marketability. With her famous parents, her unconventional education, her scandalous elopement, her writing of Frankenstein, and Shelley's death, there is a wealth of material from which to draw. And I'd love to see such a character get an HEA. Interesting idea about Aspasia, Janga, but I think you are right about antiquity. Women were regarded so poorly that it would be hard to make it appeal to the modern reader. Mary Shelley, OTOH, would be a great starting point. And because one is writing fiction "inspired by" one can choose what aspects of her life to keep and which to discard. Congratulations on your new book. The Fox sisters are interesting. They claimed to be clairvoyant and their story begins in NYS and moves onto London. I had to google the Foxes though I have encountered 19th century spiritualism quite a bit in my reading. The writer would have to decide whether to treat them as genuine or a hoax. Did you see Coat of Many Colors, the made-for-television movie about her life? That would be different! Love Dolly. I would love to see a book written about Princess Margaret. I know that she had a bit of a turbulent love live. Please don't enter me into the contest, as I only read print books. I'm looking forward to "Secrets of a Soprano" coming out in print. I think she was an interesting character. I wonder how much of her turbulent love life was tied to the fact that she was not allowed to marry the man she loved? Poor Margaret. A victim of Royal marriage policy. I always heard that she was very witty and fun. Soprano is available in print, Diane. If you win the drawing I will send you one - as long as I don't have to mail it overseas! Florida is cool. I know, Poor Margaret. She was so different to the Queen. Yes, I live in Florida, but miss England very much. It's fascinating, Judi. I highly recommend it! I have always been fascinated with Irish history, perhaps there is a story you can do about Ireland's only female pirate. Grace O'Malley. Now that would be a great read. A female Irish pirate? I'd buy that story in a heartbeat! I'll have to look into her, Catherine! Indian guide Sacagawea, former First Lady Edith Bolling Wilson, Civil War spies Rose O'Neal Greenhow and Belle Boyd, actress Ruby Dee and Revolutionary War veteran Molly Pitcher would all make excellent novel heroines. Thanks for a good post. I'd enjoy reading a story loosely based on George Eliot, that is, a woman taking a man's name to give herself more artistic freedom in her time and all that could happen with that. Eliot also did so to protect her private life as well which would likely be very difficult to incorporate in a romance novel, but I like the writing part of the idea anyway. BTW, I've been hooked on your books since the very first one I read, The Wild Marquis. Like Janga, I too would enjoy more of the Burgundy Club if that can ever come about down the road. Also, I don't have an e-reader and so am not eligible for the drawing but I'm commenting because you're one of most favorite authors and I wanted to tell you so. I so enjoy your writing. Emmeline Pankhurst the most famous of the suffragettes had a daughter, also a force in the women's movement. I'd love to see the daughter in a tumultuous romance. Would love or conscience win out?